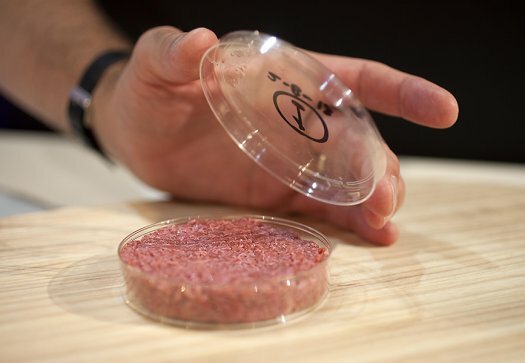 Would you eat a hamburger grown in a lab? Everything has chemicals in it, so that shouldn’t be a nonstarter for people when they think “food and lab” or more generally, genetically modified food (GMO). I guess, we cringe at the thought of food grown in a lab, but why not food that came from a slaughterhouse? I mean, slaughterhouse; it even sounds more crude and the antithesis to what one would envision a lab as being: clean. Do most people even think or care where their food comes from? Would we see in the future taste testings like we did with Pepsi and Coke, where you’d have a hamburger from a lab and a hamburger from a slaughterhouse side-by-side and you taste for the difference? All in all, I would not be opposed to trying it; it’s still food. I wouldn’t eat it mainly because I don’t even eat regular meat (except sometimes fish), but I think for most people who do eat meat the main issue is they aren’t used to it simply as an idea, just as the idea of a slaughterhouse is, for most people, only a vague idea and not a reality they’ve personally witnessed. I think many people are so thoroughly detached from the actual source of their food that they probably would be more revolted to watch animals being slaughtered than to eat something grown in a lab. The reason that they’re okay with idea of slaughterhouses regardless of this is because they really don’t even think about it, like something that’s forgotten about until you remind someone, and even once reminded they’ve known long enough to be numb to it and not shocked. Meat grown in a lab is new enough that they can be shocked. There’s other things grown in labs that we already eat all the time, but as I mentioned people are detached from their food source and may not even know where it comes from. For example, in ye olde days yeast was gotten through means such as scrapping it off of grapes in a vineyard. Today the yeast used to rise bread is grown on an industrial scale in what is, basically, a lab setting. Great comment and insight. I think you’re definitely right. Even as someone that generally is okay with eating any kind of meat from almost anywhere, I would most likely be quite repulsed if I witnessed a slaughterhouse first-hand and made the “idea” of it more tangible. Thanks for the feedback!